Okay, it is about time I finished up my coverage of the abstracts covering Io science for next week's Lunar and Planetary Science Conference. Today I am going to talk about "Modeling the Sublimation-Driven Atmosphere of Io with DSMC" by Andrew Walker, Sergey Gratiy, Deborah Levin, David Goldstein, Philip Varghese, Laurence Trafton, Chris Moore, and Benedicte Stewart. A paper in press in Icarus was published last month by the group covering this topic, "A comprehensive numerical simulation of Io’s sublimation-driven atmosphere". This post will act as a summary of both the LPSC abstract and the paper. The LPSC paper will be presented as a talk next Wednesday afternoon, March 3 in the Planetary Atmospheres session. In their model, Walker et al. used the Direct Simulation Monte Carlo (DSMC) method for simulated Io's rarefied atmosphere in three dimensions. Previous modelers explored Io's atmosphere as a single dimension, looking at how column density and temperature changes over the course of a day in response to changes in surface temperature, or as a two dimensional model that looked at how these parameters changed across a single latitude, axi-symmetric with the sub-solar point. 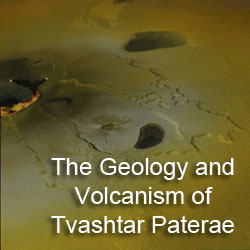 With a three dimensional model, the authors were able to explore the effects on Io's atmosphere from volcanic plume activity at known volcanoes like Pele and Prometheus, plasma bombardment heating from above, planetary rotation, sub-solar temperature (115-120 K), the residence time of fine-grained sulfur dioxide frost on bare rock, and variations in frost temperature and areal coverage. The DSMC method models individual sulfur dioxide molecules (usually representative of the total number of molecules), which is useful when the atmosphere has such low density that the mean free path of sulfur dioxide molecules exceed that the length over which many gas properties propagate. Similar modeling was performed by Austin and Goldstein 2000, though this new model includes the inhomogeneous frost coverage mapped by Galileo NIMS. This also allows the authors to graph variations in the translational, vibrational, and rotational temperatures (related to the different emission bands of sulfur dioxide based on motions of the S-O bonds), density and column density (number of sulfur dioxide molecules per cubic centimeter or over a square centimeter of Io's surface, respectively), and flow rate (expressed in the article as mach number). 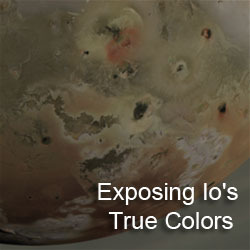 Since the authors primarily modeled the sublimation component of Io's atmosphere, the column density and many of the other properties of the lower atmosphere were related to the temperature and areal coverage of sulfur dioxide frost on the surface as this part of the atmosphere would be in vapor-pressure equilibrium with that frost. Because of the difference between the position of the peak frost temperature and the sub-solar point, ~30° to the east or 2pm local time, the column density near the surface peaks to the east of the sub-solar point. This lag in peak frost temperatures results from the thermal inertia of SO2 frost. Changing the sub-solar peak temperature from 115 K to 120 K causes a five-fold increase in the peak atmospheric column density from 4.7×1016 cm–2 to 2.7×1017 cm–2. This brackets the lower and upper bounds for the atmospheric column density measured by earlier observers of Io's atmosphere. Compare this to the column density to the Earth's, which is ~3×1025 cm–2. I should point out at this point that this group published a companion paper (Gratiy et al.) that actually showed up in the Icarus in press page first, and was discussed here last month. 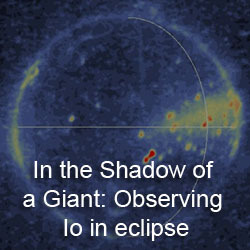 This paper compared their model of Io's atmosphere to actual observations taken a ultraviolet, infrared, and millimeter wavelengths. One note that Walker et al. does make is that the variation in column density with latitude doesn't seem to match the Hubble Lyman-α observations, which showed a sharp drop-off in atmospheric density poleward of ±45°. They suggest that this could be because of differences in frost temperature from the assumed cos1/4(ψ) latitudinal variation. In other results, the authors found that heating from the Io plasma torus inflates the upper atmosphere of Io and keeps the nightside atmosphere from completely freezing out. 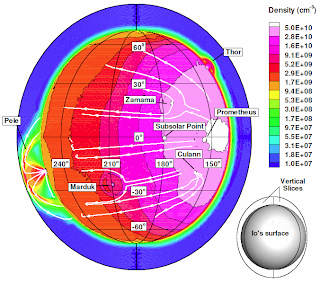 Plasma from Jupiter's magnetosphere only penetrates down to an altitude of 1 km at the point of peak frost temperature, and the altitude decreases the further you get from that point, reach the surface at the poles and on the nightside. This actually means that the low altitude translational temperature of the SO2 in the atmosphere is higher on the nightside (where plasma reaches all the way to the surface due the lower atmospheric density) and particularly along the terminator. At the terminator, the higher density dayside atmosphere interacts with the low density nightside atmosphere, leading to supersonic gas flow just past the dusk terminator and near the poles. Tomorrow we will take a look at another LPSC abstract and Icarus paper by this group on modeling Io's auroral emission.